Truck accidents happen on a daily basis. They can be among some of the scariest and life-threatening of automobile accidents when it involves a passenger car. If you have been involved in a truck accident, or know someone who has, then you know just how serious they are. 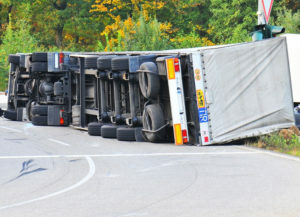 Nathaniel Preston, truck accident attorney in Chandler, AZ, also knows just how serious they can be. With his years of experience in trucking accidents in Chandler, he knows how to handle a diverse range of cases. What kinds of trucks are involved in accidents in Chandler, AZ? Chandler, Arizona, has become over recent years a hub for freight services and logistics companies. There’s American Freightways, Platinum Logistics, BC Logistics, American Group, GlobalTranz, among many other such companies. Already present in Chandler were a large number of trucking companies that have provided a good number of trucks on our roads for decades. With the growth in this industry comes an increase in big semi-trucks, and this increase in trucking activity has made truck accidents a common theme for Chandler drivers. But semi-trucks are not the only trucks causing automobile accidents in Chandler. There are all kinds of commercial trucks that are involved in accidents. In 2015, there were 496,631 registered commercial vehicles throughout Arizona, and many of these trucks were involved in motor vehicle accidents the same year, according to the Department of Transportation in Arizona. gory is the highest, this includes all kinds of trucks whose total sum as individual categories do not add up to any significant number, but combined, make up more than 50% of total truck accidents in Chandler and throughout Arizona. 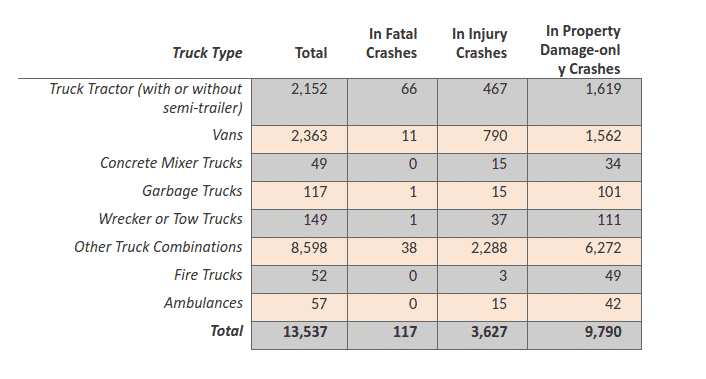 The table shows that injuries were reported from accidents in each truck category. Fortunately, not all categories had results of accidents that led to deaths. How many are killed or injured each year because of truck accidents in Arizona? Truck accidents are numerous, and as above-mentioned, many of those accidents involve fatalities and injuries. In 2015, there were a total of 2,130 injuries and deaths to drivers and passengers combined because of truck-related accidents, of that total 22 drivers were killed and 10 passengers were killed. What are some of the causes of truck accidents in Chandler, AZ? Driving large trucks require training and skill as well as a special license: commercial driver license (CDL). Trucks are overall more demanding to maneuver due to their size, and the wider blind spots make it dangerous for other automobiles sharing the roads with these trucks. Given the sheer size of trucks and the dangers associated with it, there are a number of reasons trucks cause accidents. The primary reason, like for all automobile accidents, is human error, which includes losing control, drinking and driver, disobeying traffic rules, drowsy while driving, overloading. Other causes, however, play a larger role in truck accidents as opposed to passenger cars-related accidents; with trucks, there tends to be more technical and mechanical malfunctions than other vehicles. To counter the problems associated with mechanical and technical errors, Arizona takes inspections of trucks seriously. The most recent data indicates that each inspection finds 2.7 violations on average, which ranks Arizona 5th in the nation for truck violations. That’s the average, and not every truck inspection results in violations. In fact, 38% of all inspections end up clean, with no violations. The national average, however is 40%. In Arizona, the biggest causes of truck accidents are maintenance, traffic violations, drowsy while sleeping, and insufficient training. On average, according to Evan Transportation, semi-trucks that travel regionally gobble up 45,000 miles a year while a semi-truck that travels longer distances can eat up 100,000 plus miles a year. Commercial trucks altogether consume 250 million miles or road a year. That’s a lot of road, and a lot of maintenance. Arizona is serious about inspections because maintenance of trucks has proven to be a big issue. Maintenance makes up 67.8% of all inspection violations, which ranks Arizona as 19th in the nation. The following table identifies the three biggest maintenance issues that can lead to accidents. *Data taken from CSA’s Data Trail. Traffic violations include anything from speeding, failing to yield the right-of-way, and drinking and driving. The data from inspections indicates that Arizona has a problem with truck drivers driving while sleepy. In fact, 17% of all drivers at inspections were cited for hours of service, which means according to their logs, they had been driving much longer than permitted by law. The percentage of 17% ranks Arizona as 10th in the nation for hours-of-service violations. Insufficient training or experience. Trucking companies want to increase their profits by hiring cheap truck drivers, and cheap truck drivers often tend to be the less experienced truck driver. These causes of truck accidents result in head-on collisions, rear-end collisions, under-ride collisions, side collisions, and roll-overs, the last of which is the primary type of truck-related accident. If I’ve been in an accident caused by a truck, who’s responsible? Any number of people or entities can be responsible for your truck-related accident. The cause will be the primary indicator to determine who is liable, but that alone is not the complete answer. Relationships in the truck industry are multi-layered. You will need an experienced truck accident attorney to help with a truck-related accident. Truck Driver/Owner. Like all motorists, truck drivers owe a duty of care to all other motorists and their passengers on the road. They also owe a duty of care to inspect and maintain their trucks to ensure they are safe to drive on Arizona roads. Regular inspection should prevent maintenance problems with brakes, tires, and other mechanical or technical parts of the truck. Trailer Owner. The trailers that truckers tow are owned by trucking, shipping or other companies. Those companies as the owners have a duty to maintain, inspect and properly load the trailers. Truck/Trailer Leasing Company. Truck and trailer leasing companies are responsible to maintain and inspect on a regular basis the trucks and trailers they lease to other truckers or companies. Cargo Shipper, Truck Loaders. A shipper or truck loader must ensure that cargo is not overweight and is properly loaded, balanced, and secured. Truck & Parts Manufacturers. Manufacturers of trucks and parts have a duty to design and assemble their products with due care and safety in mind. Road Authorities. Government or private road authorities are responsible to make sure that the design, construction and maintenance of the roads they manage are proper and safe. If any of the above parties neglect their duties in one way or another and that breach of their duty in some form or another causes the truck-related accident, then that party is partially, if not fully, responsible for all damages. The tricky part is first determining the primary and contributing causes, and second breaking those causes down to determine why the malfunction happened and at what percentage. For example, a trucker may have been drowsy while driving a leased truck when the brakes gave way on a piece of interstate that had gravel on it unexpectedly. As a result, the truck driver lost control of the truck and crashed into you. All these causes are uncovered during a thorough investigation. An experienced attorney, along with experts in the field, will determine the percentage of each cause. As one can see due to the nature of the trucking industry, a truck-related accident can be daunting; only an experienced attorney will have the investigation skills, resources, legal skills and network to uncover all the aspects that will help you recover the right amount of compensation. Generally, if eligible, compensation will include economic damages (.e.g, medical bills, loss of income, property damage) and non-economic damages (e.g., pain or suffering, loss of enjoyment, loss of consortium). Your truck accident attorney in Chandler, Arizona, will be able to calculate your damages according to the specific facts of your case. What can a truck accident attorney do for me? If you have been injured from an accident involving a truck, you can expect truck and truck-related companies and their insurance companies to be aggressive almost immediately. The un-mentioned goal of a claims adjuster is to find fault in you so that the insurance company either does not have to payout a settlement or, in the alternative, can reduce the settlement amount. Both trucking companies and insurance companies are more worried about their bottom line than your pain and suffering caused by the accident. Hiring a truck accident attorney is your number one defense to the aggression and manipulation you will face when interacting with claims adjusters. An experience truck accident attorney already knows what to expect and is prepared for it. Trial preparation, if the claims process breaks down. Nathaniel Preston’s practice also includes personal injury and wrongful death. If the truck-related accident involved either injury or death, he can provide you with his experience in this regard. Your compensation will reflect his knowledge and skills to your benefit. Who should I contact if I’ve been in an accident caused by a truck in Chandler, AZ? If you or a loved one has been involved in a crash caused by a negligent truck driver in Chandler, Arizona, you have rights. An experienced truck accident lawyer will help you determine your eligibility for file a claim against the negligent party(s). Nathaniel Preston is an aggressive yet compassionate truck accident attorney serving Chandler, Arizona, and the greater Phoenix area community. Contact him today to discuss your case.